330 Dartmouth is located on the SW corner of Beacon and Dartmouth, with 236-238 Beacon to the north, across Beacon, 328 Dartmouth to the south, across Alley 418, 255 Beacon to the east, across Dartmouth, and 259 Beacon to the west. 330 Dartmouth was designed by Blaikie and Blaikie, architects, and built in 1889-1890, for mason and builder Peter Graffam, one of three contiguous apartment buildings (330 Dartmouth, 259 Beacon, and 261 Beacon). He and his wife, Alice S. (Tufts) Graffam, lived in Malden. 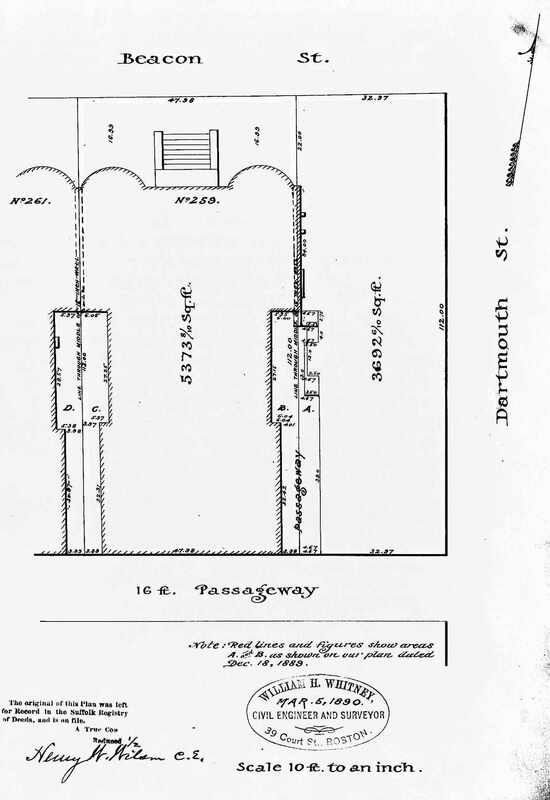 The original building permit application for 330 Dartmouth has not been located, but Peter Graffam is shown as the owner on the final building inspection report, dated December 16, 1890. 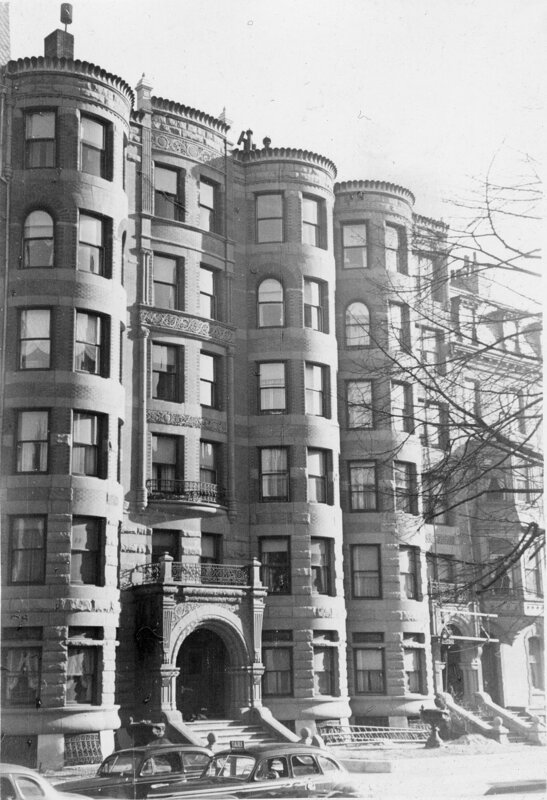 He also is shown as the owner of the two Beacon Street buildings on the original building permit applications, dated December 13, 1888, and on the final building inspection reports dated December 30, 1889. 330 Dartmouth was known as The Graffam and 259-261 Beacon were known as The Grosvenor. Over the years, the three buildings changed hands frequently, sometimes being held by one owner and sometimes being held by different owners. 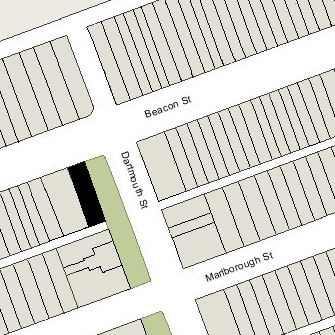 All three were converted into condominiums: 330 Dartmouth in 1979, 259 Beacon in 1984, and 261 Beacon in 1983. Peter Graffam purchased the land for all three buildings, with a 105 foot frontage on Beacon, on October 25, 1888, from dry goods merchant Eben Dyer Jordan, co-founder of the firm of Jordan, Marsh & Company. Eben D. Jordan had been conveyed the land one week earlier, on October 19, 1888, by the Commonwealth of Massachusetts. The land originally had been sold by the Commonwealth at its auction on October 26, 1865, and Eben Jordan either was the successful bidder at that time or acquired the right to purchase it from the successful bidder, but in either case did not complete the transaction until he had a buyer to whom he could sell it. Click here for an index to the deeds for 330 Dartmouth. Peter Graffam sold all three buildings between 1889 and 1891. As built, there were open passageways between each building about 7 feet wide running from the alley north about 30 feet to an open courtyard about 11 feet wide and extending about 25 feet to the north. When the buildings were sold, the deeds established easements to ensure that these areas would remain open for the benefit of both properties. On April 24, 1891, 330 Dartmouth was purchased from Peter Graffam by Samuel Little, president of the National Rockland Bank. He and his wife, Elizabeth (Malbon) Little, lived in Roxbury. In June of 1891, he acquired 259 Beacon. Samuel Little also was president of the E. Howard Watch and Clock Company, and his son, Arthur Malbon Little, was the treasurer. In 1898, the company encountered financial difficulties, and Samuel Little and the E. Howard Watch and Clock Company assigned their assets to Frederic E. Snow, as trustee for the benefit of their creditors. On April 25, 1899, 330 Dartmouth and 259 Beacon were acquired from Frederic Snow by Alexander H. Ferris, Albert D. S. Bell, and Edward W. Pope, trustees of the Grosvenor Trust. On April 30, 1900, both buildings were acquired from the Grosvenor trust by a trust established under the will of Frederick Lothrop Ames for the benefit of his daughter, Helen Angier (Ames) Hooper, the wife of Robert Chamblet Hooper. The Hoopers lived at 448 Beacon. In May of 1900, the trust also acquired 261 Beacon. Helen (Ames) Hooper died in February of 1907, and on September 22, 1909, the properties were transferred to Philip Dexter as guardian for her only child, Helen A. Hooper, a minor. In December of 1909, all three buildings were acquired by real estate dealer Frederick Augustus Whitwell. He and his wife, Mary Crowninshield (Silsbee) Whitwell, lived at 113 Marlborough. He died in July of 1912 and his estate sold the buildings to real estate dealer Loren D. Towle. On February 1, 1913, 330 Dartmouth, 259 Beacon, and 261 Beacon were purchased from Loren D. Towle by the Methodist Religious Society, which continued to own them until January of 1923. The properties changed hands and in May of 1924 were sold to three separate owners. They all changed hands again, and by December of 1924 were all owned by real estate dealer George F. Welch. On December 10, 1926, they were acquired from him by real estate dealer William J. Stober, who sold 259 Beacon and 261 Beacon that same month, and retained 330 Dartmouth. It remained under separate ownership from that time. By the 1920s, 330 Dartmouth had become a combination of medical offices and apartments. On December 9, 1932, the Institution for Savings in Roxbury and its Vicinity foreclosed on its mortgage to William Stober and sold 330 Dartmouth to Edward Lyons. On October 17, 1934, the bank foreclosed on its mortgage to him and took possession of the property. By 1939, 330 Dartmouth was entirely medical offices, and remained such until the 1950s. The Institution for Savings in Roxbury continued to own 330 Dartmouth until 1945. The property then changed hands and the use migrated from offices back to apartments. On January 5, 1965, 330 Dartmouth was purchased by Jack Eadie Molesworth. He was a philatelic dealer specializing in Confederate stamps. A leader of the ultra-conservative Young Americans for Freedom and a Republican State Committee member, he was an unsuccessful candidate for Congress in 1964. He and his wife, Phyllis (Carpinteri) Molesworth, lived in an apartment at 88 Beacon. In January of 1979, Jack Molesworth filed for (and subsequently received) permission the change to occupancy from fourteen apartments to fourteen apartments and three medical suites, which he noted was the existing condition. On April 4, 1979, 330 Dartmouth was acquired from Jack Molesworth by John V. O’Neil, trustee of the 330 Dartmouth Street Realty Trust. In May of 1979, John O’Neil applied for (and subsequently received) permission to remodel the three medical units and convert the property into seventeen apartments. 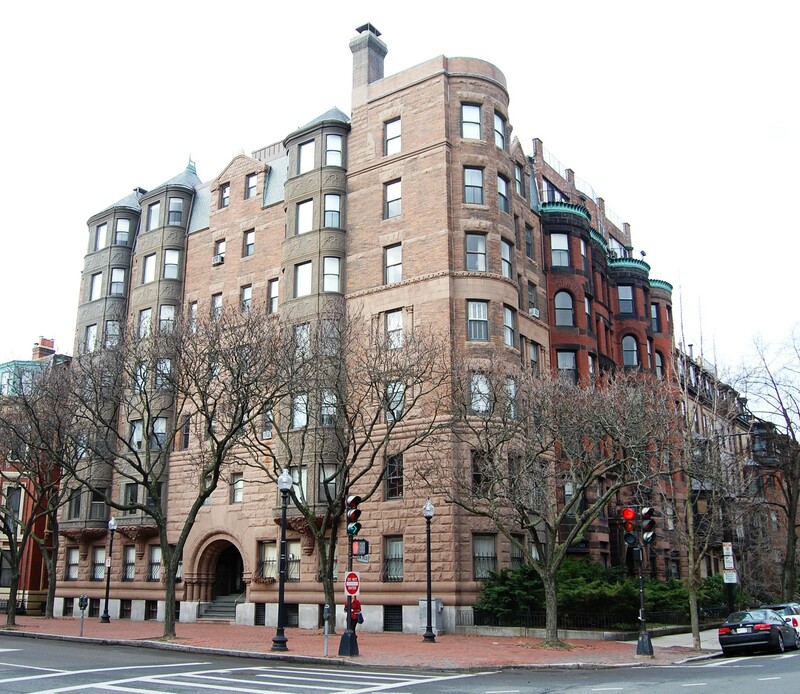 On August 6, 1979, he converted the property into seventeen condominium units, the 330 Dartmouth Street Condominium.